SEED [pod]'s unique steel structure is designed to capture rainwater and aid in cooling the solar panels for maximum efficiency. The house will be reconstructed on the University of Arizona campus. 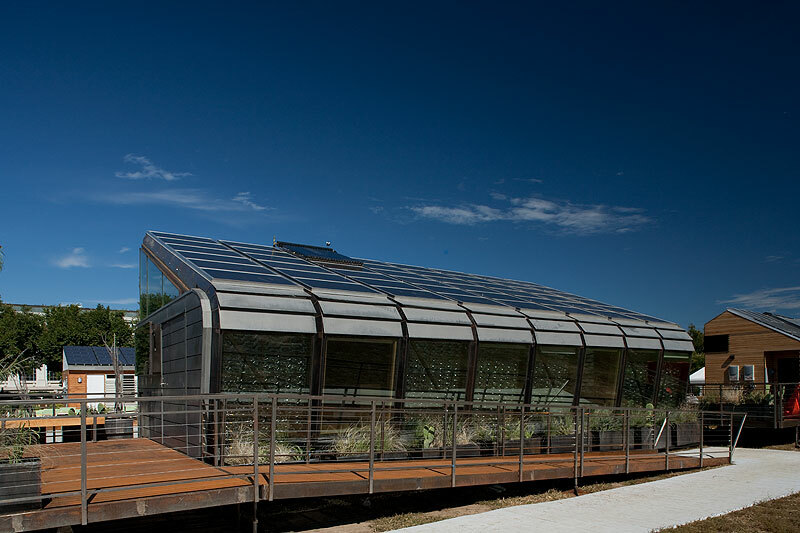 Following the U.S. Department of Energy Solar Decathlon 2009, the University of Arizona team switched gears to raise funds for the continued growth of its project, SEED [pod]. According to the team's project manager, Matt Gindlesparger, SEED [pod] requires more resources before it can be reassembled on campus. Students at the University of Arizona wanted to build a house that could collect and reuse water, grow food, and produce energy for Solar Decathlon 2009. They began by drawing inspiration from the balance that exists in nature despite a constantly changing environment. Then they went to work. After much time, collaboration, and effort, an innovative house materialized. SEED [pod] features technologies—including solar panels that adjust to the optimal angle for harvesting solar energy at any location—that embody the team's vision. Next, it was time to show the world how a highly efficient dwelling could interact with surrounding spaces, natural forces, and engaged inhabitants. SEED [pod] performed well in both the architecture and engineering contests at Solar Decathlon 2009 and earned top-10 finishes in each category. Ultimately, the University of Arizona would like to use the house as a demonstration site for sustainable living. This would help realize the team's initial vision, in which future homes serve as contributors to their communities rather than as drains on the world's resources.